Adaptation explores religious roots of Shakespeare’s Moor of Venice as director says play is warning about ‘otherising’. 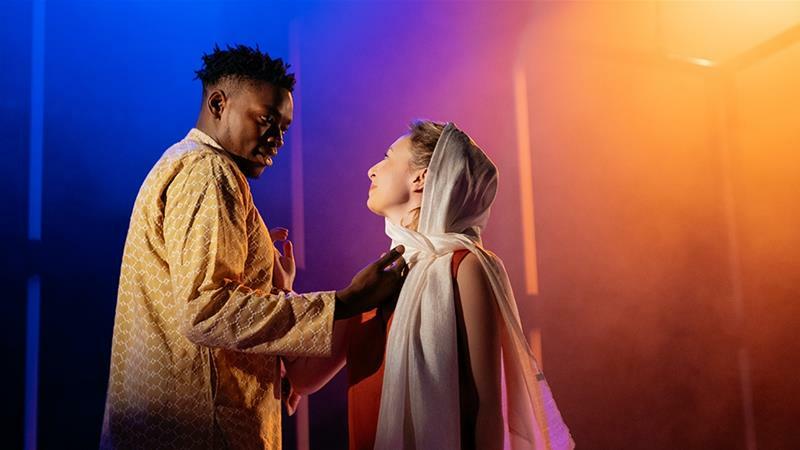 A new adaptation of Othello in the UK subtly interrogates the tragic hero’s religious identity, presenting to audiences the possibility that the Moor of Venice was a closeted, practising Muslim. Produced by the English Touring Theatre, there is an Arabic recitation in the opening scene and an image of Othello with his hands cupped in what is unmistakably a Muslim prayer. “I was very aware of the racism Othello suffers because of his skin colour, but there was a much more insidious and layered thing that was happening to him as an outsider,” director Richard Twyman told Al Jazeera. “The biggest thing is within the language, where Othello is constantly called the Moor. We know historically about the Moorish kingdom of Spain (where Spanish Muslims or Moriscos’ were forcibly converted to Christianity in 1492). But I never put it together that Moor might also be referring to Othello’s spiritual and cultural identity,” he said. It was not until Twyman encountered the research of Jerry Brotton, professor of Renaissance Studies at Queen Mary University of London and author of This Orient Isle: Elizabethan England and the Islamic World, that it became plausible Islam was intrinsic to Othello’s identity. Brotton told Al Jazeera: “A Moor is an inhabitant of Mauritania which is in northwest Africa. It’s effectively modern-day Morocco. In addition to the opening prayer scene, in which Othello unfurls a prayer mat for him and Desdemona to sit on during their marriage ceremony, the play makes other references to his spirituality. He also moves from one religion to another. A crucifix hangs from his neck throughout the play, but when he is told of his wife’s alleged infidelity, he raises his prayer beads and shouts in Arabic, “Ya Akbar”, “Oh, Great One”. Viewed in the historical context in which it was written, Othello offers a glimpse into the economic and political anti-Catholic alliance between Elizabethan England and the Muslim world. “Spanish Catholicism for Protestant Elizabethan England was the absolute enemy,” Brotton said. This entry was posted on Friday, November 16th, 2018 at 00:02	and is filed under Uncategorized. You can follow any responses to this entry through the RSS 2.0 feed. Both comments and pings are currently closed.